50 meter rope quickdraws – at least - 10 helmets (!) – t here are the mountains, not a trainer. Here everything is possible! 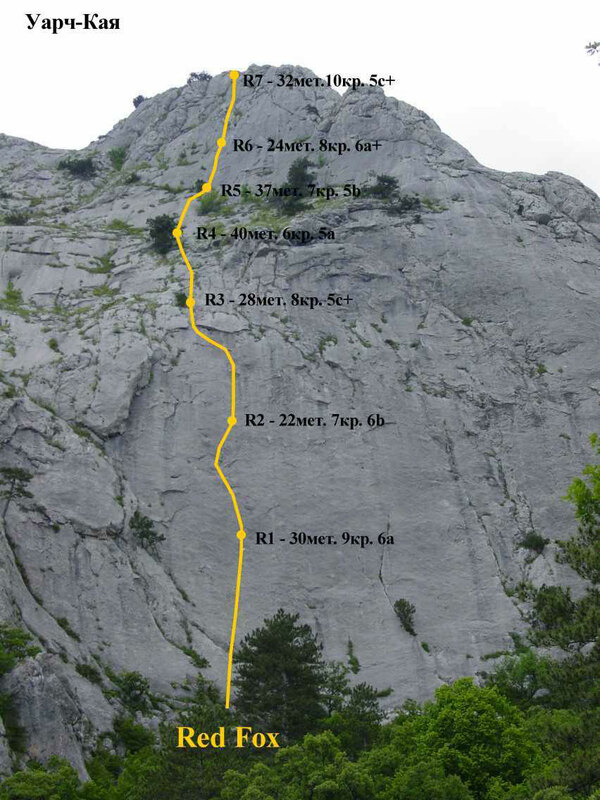 The route, equipped by permanent belay points , goes along the beautiful solid face and allows to enjoy free climbing. It has very quick and comfortable approach to the face, not difficult climbing (for good climbers), fully bolted. Quick and easy descent along the path to the foot of the face (to the road). The route is mainly cleaned from the moving stones the route line goes through the solid rocks. The beginning is signed, pins are marked with yellow paint, and it is very difficult to be lost! Section R1-R2 is the crux of all the route! From the first "belay" make two steps to the right – to the small but natural holds - and climb upwards to the first pin. On this section pay special attention on climbing till the first pin, not to fall down on the belayer!!! The route "Red Fox", artful as a fox makes sharp turns to the left and to the right from the pins. It is recommended to use the belays and pins according to their intended purpose, not to use all the rope length. Voloshin Vasiliy ( St. Petersburg ) – for the pins. Jilin Alexey ( Odessa ) - for perforator.